Berlin has undeniably become one of the world’s street art capitals. In the 1980s, as Berlin stood divided, the first graffiti gang started marking their territory in the city’s southern Kreuzberg district and the Berlin Wall’s Western side began to serve as the canvas for comments, tags and un-sanctioned murals. However, it is only over the last few decades that this city has grown into a magnet for street artists from around the world. The Berlin Wall has largely disappeared and although memories of World War II and the Cold War are fading, the cityscape these conflicts left behind still provides artists with room for self-expression and statements. Berlin’s abandoned spaces, its streets, its empty plots of land and bare walls have become populated with a kaleidoscope of murals, graffiti, stencils, paste-ups, guerrilla knitting and more. 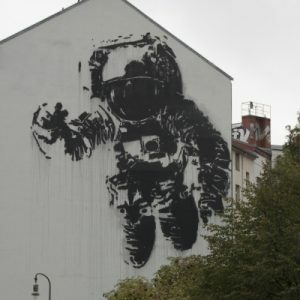 Whether they consider themselves sprayers, graffiti writers or street artists, all can count on an evergrowing audience among Berlin’s residents and the tourists who flock here to see their work. While some pieces are officially commissioned, much of this streetart is legally considered vandalism, most pieces appear overnight, with a limited life expectancy, all part of an everchanging tapestry. The Berlin police actively hunt ‘trainwriters’ in order to prevent millions of Euros spent for clean-up, but there are also legal graffiti zones or spaces with a high tolerance for what is considered a relevant youth culture and form of artistic expression. Graffiti and street art began as a form of protest and subversion: otherwise unheard voices leaving a message in the most public of forums, the street. Now, it has become so popular that galleries, once a target of street artists’ protest against the art establishment, sell it. Advertising and election posters were and still are manipulated and/or vandalized in protest but likewise modern day advertising often uses street art’s youthful appeal for its own purpose. The landscape of street art has become diverse, much of it is unapologetically and unavoidably local, but the artists, audience and the messages transmitted are growing globally. And some say that nowhere more than in Berlin today, this movement is gathering pace. For many, touring and photographing it has become as much a city attraction as the Brandenburg Gate or Checkpoint Charlie. Haus Schwarzenberg – The courtyard is filled with fresh and constantly changing street art, but within the increasingly glossy facades of Berlin Mitte, the cultural ensemble’s colourful but delapidated facade is one of the last reminders of the experimental and alternative cultural spaces that mushroomed in East Berlin in the 1990s. Tacheles – The ruin of a former department store in Berlin Mitte that sadly since 2012 is closed to the public. From outside one still gets a glimpse of the first building in East Berlin to be squatted by an artist collective, a group which succefully blocked the buildings demolition in 1990. For two decades filled with several art studios, a cinema, a bar and concert venue, the remaining ruin still features a variety of old and new street art pieces, large and small – awaiting its demolition in the not so distant future. RAW Gelände – An ensemble of buildings and lots once used by the German railway for train maintenance and repairs, side by side with the tracks headed East, now home to several clubs, street art galleries, bars, studios, boulder halls and start ups, all united by a colourful street art tapestry. Brimming with people during Berlin’s summer nights. East Side Gallery – The longest remaining stretch of the Berlin Wall, painted in its entirety after its fall by more than a hundred international artists in the summer of 1990. Kreuzberg 36 – The district referred to as Kreuzberg 36 is filled with some of the most prolific murals of Berlin. Some of them are closely connected to the initiative of Backjumps, a graffiti fanzine started in 1995. Its festivals invited artists from all over the world such as BLU or ASH. Artists met in Berlin and left behind signature pieces. Other districts known for street art are Mitte, Prenzlauer Berg, Friedrichshain, Neukölln and Wedding. Legal graffiti walls can for be found in Mauerpark, at Ostbahnhof (Maria Hall), the ‘Eisfabrik’ and Gleisdreieckpark.